Schlage mobile credentials (formerly aptiQmobile) put you in control by delivering smarter solutions. These credentials protect your most sensitive data by utilizing extra layers of security protection, and can be used for many other applications including transit, cashless vending, and cafeteria point of sale. Schlage proximity technology is an easy, convenient access control solution. Proximity technology, which operates on 125 kHz frequency, is easily integrated into existing legacy proximity systems or ideal for a new installation. Proximity credentials can easily fit into a wallet or may be used as a strapped or clipped badge. 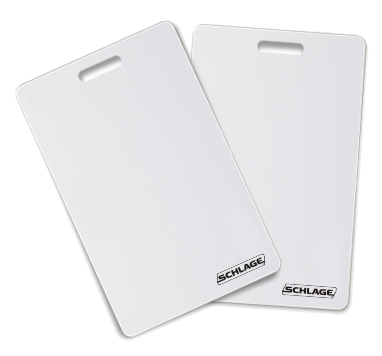 ​From highly durable clamshell-style cards, to basic ISO style cards, to keyfobs and adhesive patches,Schlage offers several different form factors to meet the needs of many different customers.